MASVINGO - Zanu PF bigwigs that are annoyed by pressure from the MDC Alliance leader Nelson Chamisa are agitating for the ruling party to use its two-thirds parliamentary majority to amend the Constitution and limit political freedoms. 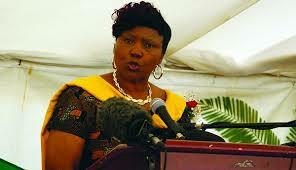 Defence minister Oppah Muchinguri, who is also the Zanu PF national chairperson, told a provincial inter-district conference at Masvingo Polytechnic on Monday (December 3) that the ruling party will make laws to stop ‘the opposition madness’. “I want to thank you Masvingo for voting Zanu PF and giving us 25 out of the 26 parliamentary seats in the province. You contributed so that we have majority in parliament and we can change any law in our Constitution to fit our needs. “Zvakuita manje tava kutonga nekuti ndimo munodiwa kuti tichinje mutemo (It’s now possible we have to change some laws). Zviri kuitika izvi imi wee-e wanhu wakufarisa, iwo maopposition members aya akufarisa (These opposition members are enjoying too much freedoms),” said Muchinguri. He words were soon followed by calls from war veterans secretary general Victor Matemadanda to amend the Constitution and raise the age of eligibility to contest a presidential election from 40 to 52 in a move seen as an specifically targeted at eliminating Chamisa’s chances of contesting President Emmerson Mnangagwa in 2023. Chamisa will be 45 years of age in 2023. Buhera South Member of Parliament (MP) Joseph Chinotimba first mooted the idea some few months ago but the plan is said to be facing immense opposition not only from citizens but from the Zanu PF youth league. Muchinguri bemoaned the ruling party’s poor showing in urban areas claiming that was the reason why Chamisa was ‘causing so much trouble’. “We won resoundingly in rural areas but we suffered heavy losses in all urban areas. Harare boosted Chamisa’s votes because he got over 500 000 and we got about 200 000. The same trend was seen in Bulawayo, Mutare, Masvingo, Gweru and pretty much all the urban centres. “We have a lot of work to do in all urban set ups. This is what is giving Chamisa all this madness and he has to be stopped. Chamisa has been so stubborn. “He has refused to accept the election results even though all other countries have endorsed them. We had free and fair elections and President Mnangagwa was declared the winner. Chamisa refused and made a Constitutional Court (ConCourt) challenge where our President was again declared winner. Despite all this, Chamisa still remains adamant and is doing demonstrations,” said Muchinguri. Muchinguri mocked MDC Alliance supporters saying organised people will not be led to their ‘deaths’ because they would have ‘better things to do’. “When people have something to do and are organised, they don’t go into the streets to demonstrate like what we are seeing with MDC Alliance supporters led by Chamisa. People were shot and died in the streets all because they shun the ruling party’s developmental initiatives and subject themselves to poverty. They are paid $10 to get into the streets and demonstrate,” said Muchinguri. Chamisa has been on record saying they will defend their ‘stolen’ vote through peaceful protests and that President Mnangagwa is no Father Christmas who dishes out rights as they are given by the national Constitution.